Starting at $2,699, this behemoth 17-inch gaming laptop has a transforming keyboard said to improve airflow. At a press conference this morning, Acer announced a breadth of new hardware products spanning an array of different categories. 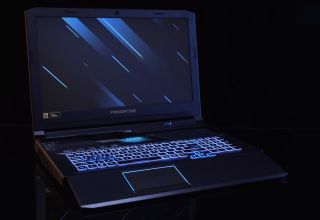 Whereas the ConceptD lineup targets creators and designers looking to relinquish their gaming computers in favor of something quieter, the new Acer Predator Helios 700 laptop is for the gamers themselves who crave absolute silence. Showcasing Intel's powerful 9th-generation Core i9 processors, 64GB of RAM and up to full-size (not Max-Q) Nvidia GeForce RTX 2080 graphics, the Acer Predator Helios 700 bears a 17-inch, full HD (1920 x 1080) IPS display featuring a 3ms response time and native G-Sync for reduced screen tearing and microstuttering. It has five speakers and a subwoofer for true onboard 5.1 surround sound. And, to top it all off, Acer incorporates Killer Wi-Fi AX 1650 and E3000 in every unit it ships. But the real selling point, Acer hopes, is the HyperDrift keyboard, which integrates directly with the system's thermal architecture. On the whole, the Helios 700 touts a pair of 4th-gen AeroBlade 3D fans, five heat pipes, and a vapor chamber. However, by sliding the keyboard out, you can expose two air intakes on top of those prominently shown on the rear of the machine. The idea is to facilitate more efficient airflow, therefore maintaining a steady, cool and quiet breeze while also improving performance. On paper, that sounds pretty useful. No one wants their gaming experience hindered by fan noise. At the same time, it does look silly in practice, and the bulky laptop's desktop footprint gets even larger when the HyperDrift keyboard is completely rolled out. That said, Acer was quick to note that the expanded keyboard doubles as an ergonomic wrist rest. Another interesting aspect of the keyboard are the MagForce WASD keys. On those four keys alone, the "analog-like" switches are linear, thus the time it takes between pressing them down and actuation is supposedly eliminated. Above the keyboard, which itself boasts per-key RGB lighting, is a Turbo hotkey that overclocks the CPU on command. Other than that, we don't know much about the Predator Helios 700. I saw it in person, and though I didn't get much time to play around with it, I was immediately struck by its unwieldy size. In terms of thickness, it rivals the Alienware Area-51m I previewed back in January. It's huge and, as far as I know, doesn't allow for the same degree of upgradeability as the Area-51m. In fact, as of right now, it's unclear whether or not it's upgradeable at all. Especially with a starting cost of $2,699, I'm skeptical the Helios 700's HyperDrift keyboard is going to make a huge difference when it comes to performance. Acer already makes one of the best gaming laptops, the Predator Triton 500, a $1,799 laptop you can configure with an RTX 2080 for $2,499. While it is limited to a 15-inch display, it's portable enough to carry around in a backpack. I can't say the same for the Helios 700 based on what I've seen so far. Nevertheless, I'll reach a more complete verdict when the Acer Predator Helios 700 lands on store shelves this July. Pricing for the RTX 2080/Core i9 model hasn't been set, but chances are, it's going to cost a great deal more than the $2,699 base price the company is parading right now.